Nokia started the trend; have you tried it? A "bothie" is a photo or a video that uses a split screen format to capture imagery or record footage through a mobile device's front-facing and rear-facing camera simultaneously. The term "bothie" refers to the ability to use both cameras at the same time. The bothie evolved from the selfie trend, which exploded in popularity several years ago as front-facing cameras became a standard component on mobile devices. A selfie involves using the front-facing camera only, typically to capture or record the device user's face, but a bothie takes it further by capturing both the user's face as well as their personal viewpoint at eye level. Capturing photos or recording videos through a device's front and rear cameras isn't anything new, but it was Nokia that coined the term bothie with the introduction of its high-end Nokia 8 Android device in August 2017 and its mid-range Nokia 7 Android device in October 2017. Nokia makes bothies possible with what it calls "Dual-Sight mode" where the front and rear cameras are activated and the screen is split into two to show both views — either as top-to-bottom if the device is held sideways or left-to-right if it's held sideways. 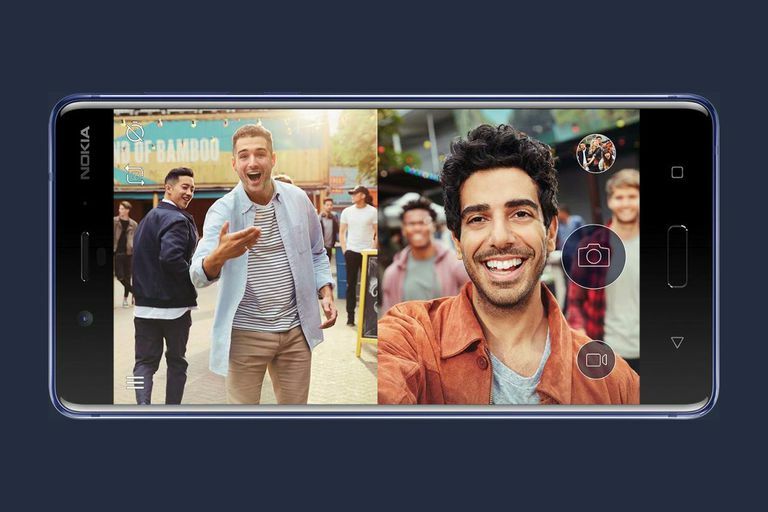 The Nokia 7 and the Nokia 8 also come with built-in bothie streaming to Facebook Live and YouTube Live, so users can talk to the camera and show their viewers exactly where they are or what they're doing. Two other known device makers that have their own bothie feature integrated into some of their device models include Samsung and LG. Samsung calls it a dual shot and LG calls it dual camera mode. The Samsung Galaxy S4 and Galaxy A5 come with dual shot functionality while the LG G2 VS980 has dual camera mode, but not all other Samsung and LG devices come equipped with it. Nokia's built-in livestream feature for bothies is also exclusive to the Nokia 7 and 8 devices only at this time, so if you're hoping to jump on the bothie trend with a different device, you have no choice but to upgrade your device or do what most people would do to solve a problem — download an app. Frontback for iOS and Android: This popular app went viral for being the first of its kind back in 2013. Built around a social community somewhat like Instagram, you can combine photos and short videos from both your front and rear cameras. While you'll be able to see through your front and rear cameras simultaneously in split screen on your device, you'll have to capture or film each separately, one after the other. You have to sign up for an account to use this free app. phoTWO for iOS: Similar to Frontback, phoTWO makes you take photos through the front and rear cameras separately before combining them. You can also only take photos and not videos. The app puts a small version of the photo from your front camera over a full-screen version of the photo taken from the rear camera in a collage-style layout, which you can then move around and adjust the size using your fingers. Frontback Camera for Android: This app is newer than the two mentioned above, claiming to work like a dual camera that allows you to take two photos from both the front and rear before putting them together in a single photo. Unlike the Frontback and phoTWO, this one can take both photos through each camera at the same time.